Socketed IC chips are simply pressed into place; removal is simply a matter of pulling the chip straight up and out of the socket. Pulling the chip up one end at a time, unless carefully done, will bend the legs of the chip, possibly breaking them. 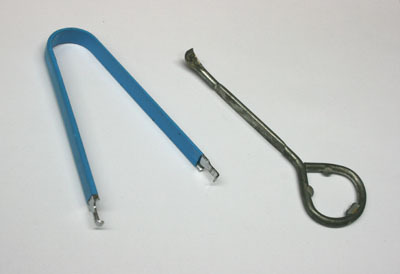 A tool for removing chips (at left in the photo) makes it easy to pull a chip from its socket; simply hook the ends of the tool under each end of the chip, and pull upward firmly and steadily. Don't yank, or you might just pull one end of the chip out, bending the legs in the process. Though these tools are inexpensive, you're not likely to find one except at places that specialize in electronics parts. The next best thing is a paint can opener, which your local Home Depot or Lowe's will give you free (when you buy paint from them - or maybe if you just ask nicely...) With this, you can gently pull up each end of the chip, working it end for end until it is free. Otherwise, a small screwdriver can be used to gently pry up the chip, but there is not always room to get a screwdriver into the right position for this. Just one caution: Make sure you are pulling on the chip itself, and not on the socket. You don't want to rip the socket off of the circuit board - that will be an expensive repair!